Sanima General Insurance, invites application from highly competent, energetic and self-motivated Nepalese citizens for the following positions. Key Requirement: Minimum Bachelor’s degree from recognized University. Candidates should be familiar with the principles, practices and techniques of Insurance Marketing Strategies. Key Requirement: Minimum Bachelor’s degree from recognized University. Key Requirement: Minimum Bachelor’s degree from recognized University and experience in non-life insurance will be an added advantage. 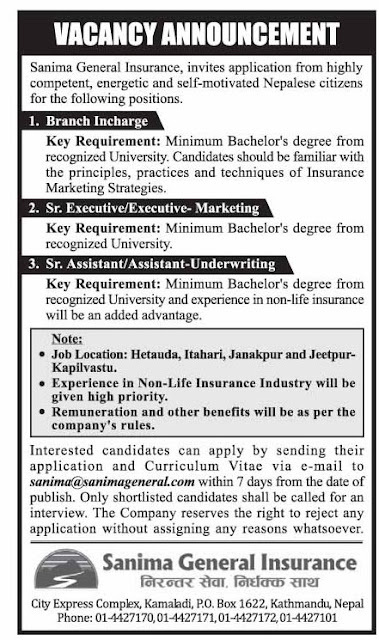 > Job Location: Hetauda. Itahari.Janakpur and Jeetpur-Kapilvastu. > Experience in Non-Life Insurance Industry will be given high priority. > Remuneration and other benefits will he as per the company’s rules. Interested candidates can apply by sending their application and Curriculum Vitae via e-mail to sanima@sanimageneral.com within 7 days from the date of publish. Only shortlisted candidates shall be called for an interview. The Company reserves the right to reject any application without assigning any reasons whatsoever.